Fun blind tasting of Napa Valley Cabernets, we decided to choose two from 2011 while my Dad selected two different vintages of Caymus Special Selection. A lot better than last time with a couple hours in the decanter. Deep ruby with garnet edges. Lots of aged characteristics on the nose, mushrooms, forest floor, chalk, peppers, a touch floral and dark fruits. Medium tannins (6/10) and medium bodied. A touch of green pepper on the palate with quite a bit of oak notes. Woody, perfume, light blue and black fruits. Rounded and well integrated throughout. Medium plus to long finish. Rough vintage but next time we need to give this a super long decant to let it air out and round it, this could easily get a few points higher. $$ - Got it from Vienna Vintners for $68.90. Tried this wine over three days but if we could redo it, we would have done it all on day one with a 6+ hour decant. Dark garnet red with a slight crimson hue. Some interesting notes of the nose. Some dark cocoa, cassis, dark berries, and slight herbal notes. The attack of the palate was coated in vegetal and green notes like a freshly broken branch, green bell peppers and something similar to sage. Moderate tannins (6.5/10) with an unbalanced body, but potential is there if this wine can get it together and integrate in the next couple years. Finished off some slight minerality. 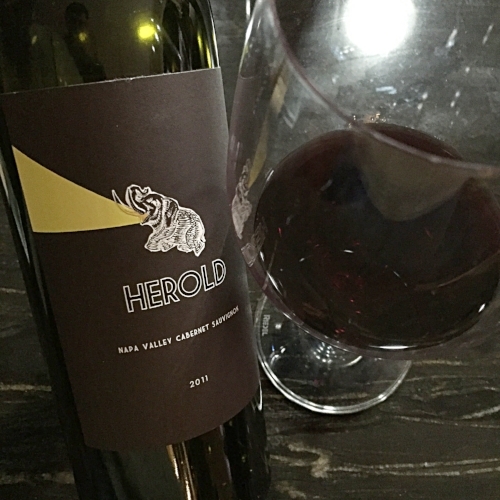 Of course with all of Mark Herold's wines there is some sediment in the glass, all of his wines are unfiltered.